In the wee hours of this morning, the CEO, Mr. Steve Samblis, posts a rather lengthily post on Investors Hangout, in what appeared to be an effort to explain the wait he has asked investors to endure. The problem is… there was nothing new in the post. Investors already knew the problems the company recently went through with the Collins incident. Yes, the post this morning was thoughtful and well written… but investors knew all of that. Where was the NEW news ??? He did add one paragraph towards the bottom of the post that briefly referenced the plans going forward, however, other than mentioning the new VU Television Network will be broadcast on “Galaxy 19″… there was no new news there either. Mr. Samblis… thank you for the effort to further inform, however investors need NEW news, not information they already know. Our post last night was about missed opportunities for releasing news (and hope) about future plans… news that would give investors a reason to stay invested, news that showed company progress… news that showed company potential. Investors need NEW news ! AND… they are still waiting for an explanation on the appointment of the new company president. Your post this morning illustrated perfectly why investors are nervous about your appointment. They do not want to be sitting here a year from now, having been invested yet another year without a return on their investment, and watch a Collins type incident unfold all over again. It goes without saying that you have every confidence in your appointment, however, you had every confidence in Mr. Collins at one time also. Investors just want some solid verifiable evidence that your appointment’s issues are out in the open… and been resolved so that this distracting controversy doesn’t slow the progress of the company’s growth at some later date. Please Mr. Samblis… PLEASE, release a formal press release about the Collins issue, how you resolved it, and the company’s current plans to move forward. You may think posting on the Hangout is equal to a public press release, but I would remind you that not all investors read and follow the Hangout. Go public…the longer you wait, the harder it will be to put the Collins incident behind you. CEO breaks silence… well, not really. Yes, the CEO Steven Samblis did break his silence today, with a little blurb on Investors Hangout. See it here, and here. Basically, as we see it, the post indicates investors should wait. Exciting things are coming… but you need to be patient, and wait. New frontiers are being forged… but investors need to wait for the announcement. Wait, wait, and wait some more. Trust him… but wait. How long should investors wait… don’t know… just wait. Trust him… the waiting will be worth it… but investors need to wait to see it unfold. This will be huge… just wait and see. Did we say investors needed to wait… oh, we said that already. Well, investors are getting real tired of waiting. They have been waiting for over a year now and are being asked to wait even longer again. The timetable for launch of the new network, company and perhaps ticker symbol appears to be sometime in the fall, however investors need to wait for the formal announcement. Yup… just wait… its gonna be big… but you gotta wait ! Now, the problem with waiting is… investors will not simply be waiting till fall… if/when all this gets launched, investors will need to wait some more for the advertising revenue to start generating deposits to the bottom line. Grandiose plans are great, and slick press releases are great, but its sales revenue and profits that drive the PPS. If there are any press releases (which investors are still waiting on based on the CEO’s previous posts saying news will be PR’ed “shortly”… here, and here.) such could possibly give a short-term boost to the PPS, but without revenue the increases will be short lived. Mr. Samblis… its seems hard to believe you can’t announce ANYTHING yet. Surely there must be SOMETHING you can announce. Yes, you did announce the appointment of the new president of the company, but there is yet-to-be explained controversy surrounding her past, and the announcement made it no further than the IC Places website. That announcement needs some explanation. Mr. Samblis… you are missing a short-lived time window to make some announcements. If this silence goes on for much longer, you will be playing catch up trying to defend the delay, and the intended impact of any positive news will be diminished. Evidence of investor frustration and exodus are already evident, and some might say widespread. Your window of opportunity to announce some plans and recent achievements is closing fast. 10-Q out… many dismayed at results. Well, its official, the 10-Q made its debut yesterday, and many were disappointed, surprised, dismayed, and yes… angry. There was some confusion over the accounting procedures used to reconcile the divestiture of Punch (as explained here), in that there was a loss of 1.57 million showing on the bottom line. However, one of the largest concerns was the recording of zero revenue. Almost everyone was shocked that IC Punch Media, Inc had no reported revenue during that time period. There was initial shock and outrage expressed on the message boards surrounding the disbelief that the company had no revenue during that time, when they knew (or thought they knew) that the company was broadcasting, and selling ad space. Early the next morning the CEO explained in this post and here and here. that the revenues stayed with Punch as part of the divestiture. As the questions began to fly from the upset investors on Investors Hangout shortly after the release of the report, the CEO became combative and what some said was dismissive of their questions, represented in posts here, and here, and here. Needless to say, angry and insulted investors fired back, and the situation grew more combative as time moved on. Then, in the wee hours of the following morning (5/22/13) the CEO reappeared on the board and began to answer questions. Most board members of course had left the board by that time, however there were still some lingering questions that he did answer. One recurring question theme was related to the divestiture, which the CEO elaborated on in this post. We think this is a significant revelation. In the post the CEO not only explains that the company did not lose anything in the Punch divestiture, but that there is a likelihood that Collins may owe IC Punch Media, Inc. the difference between the value paid in stock, and the value returned in stock. Now if most accounts of the Collins financial picture are anywhere near accurate, Collins may be what they call Judgment Proof, in that even if it is determined he owes something, he has no funds to pay. The CEO did address that situation somewhat in this post here. So… where does that leave us now, today ??? Well, here’s the good news… there was a Press Release around noon today announcing some new appointments to the company’s management. See the release here. This is exciting news. If you read through the release, you will notice a common thread in all the appointments… the ability (and previous experience) to raise large sums of capital to finance ongoing and new initiatives. This news appears to be well received by the investing community, as the stock’s PPS took a real deep dive during the opening few hours, however as we draft this post the stock has recovered almost all of the initial loss of this morning. We closed yesterday at .0032, gaped down to open at .0026, and are currently sitting at .0029, with 2 more hours of trading left today. Hopefully the PPS not only recovers, but starts a sustained climb up to the levels that are representative of the value of this company. Stayed tuned folks… this thing may be down, but certainly not out ! The CEO stated we would be hearing many good things in the coming weeks, and if the initial indication of today’s announcement is any indication of what is to come… this will be an E-Ticket ride ! Another week passes… and it’s another week wasted, because there has been no formal comprehensive press release explaining the company’s dispute between the principals. The PPS is stagnant, the rumors and innuendos are ridiculous, and the message board posters take the smallest tidbit of information and spin it to suite their agenda and/or imagination. No one knows anything because nothing has been formally released to the public. There was an excellent post here that describes the issue and suggests a remedy, however it likely fell on deaf ears. Oh yes, there have been bits and pieces of information released by the disputing parties, however nothing formal has been released explaining the disputed issues, and what, if any, steps are being taken to remedy the situation. Until such is released, we believe, the PPS will languish around the .002’s where it has been since the early days after the dispute news hit the media and message boards. Without formal facts… just about everything you may read is purely wild speculation and uninformed opinion. We implore Mr. Samblis to release a formal document to the investors and general public detailing the dispute and the remedies sought. He has already missed the only opportunity to get out in front of this in order to preserve the investors confidence. Our hope is, he doesn’t wait until its too late for any chance of recovery before realizing he needs to release a statement. We feel he has an obligation to report the issues thoroughly and honestly… and as soon as possible, given the current declining state of the PPS. Where penny stocks are concerned… silence is NOT golden ! Censorship on PunchTV Facebook page ! Well… as can be seen by the below graphics… there is obviously blatant censorship being perpetrated on the viewers of this PunchTV Facebook page (purposely did not provide a link to a site as deceitful as the subject site). You might keep that in mind if/when you visit there. If you can’t trust some of the content… can you trust any of it ??? AND… how can you trust something you can’t see… i.e. deleted because someone didn’t want you to see it. If you’re like us, when you go to a site like this, it is to get information… ALL the information, not just what someone allows you to see. It seems apparent that when that someone can not defend the truth, the next best thing to do is… DELETE it ! 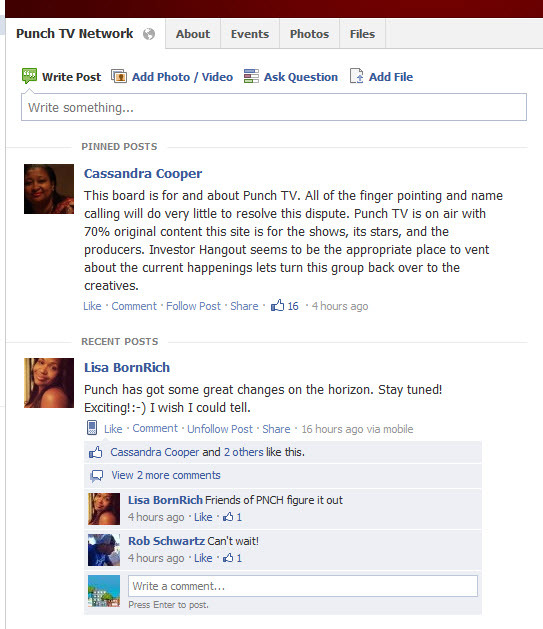 As can be seen in graphic #1, Cassandra Cooper says the board is “for and about Punch TV“. To most readers this means if its Punch TV related, it has a place on their site. 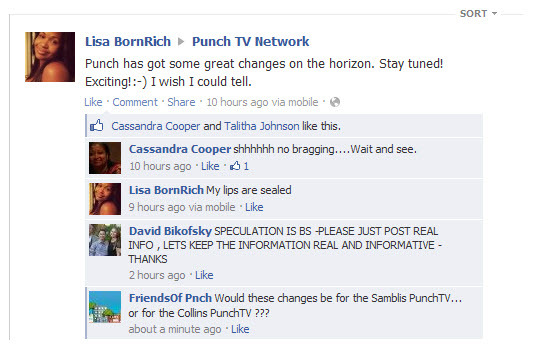 And most reasonable people would believe that the turmoil between Mr. Samblis and Mr. Collins is related to Punch TV. Also, most reasonable people would believe questions and comments from Shareholders of PunchTV stock would be related also. So, any reasonable person would be concerned if their comments were deleted and not available for other interested parties to see, and comment on. And in one reported case, the ability to post anything has been denied. Actions like these should cause concern for any interested parties. As can be seen in (the differences between) graphics # 1 and 2, there has obviously been some degree of censorship practiced here. As you can clearly see, our post has been removed. We used no profanity, nothing derogatory, nothing disrespectful… just (what we believe to be) a fair question given the current turmoil. These screen shots were taken a few hours apart, today. The difference is obvious, and speaks volumes toward the frame of mind the people in control of this site have. As we stated above… when you can’t defend the truth… the next best action to take is… DELETE it ! What a shame… and what a disservice to the readers of the site. It seems apparent the censors have no respect for their readers, and are attempting to insult their intelligence by spoon-feeding them information. Shameful… just simply shameful. PNCH PPS circling the drain ! Yes… its sad, but PNCH PPS is down today… way down at .0026, from a gap-down this morning. However, there was a slight bright spot, it held its own throughout most of the day. The PPS is back to its consistent lows of February now. Will it go lower… its likely to go lower if this ownership turmoil is not settled soon. There is a lot of news, such as CEO posts and open letters from Mr. Collins (you can follow most of it on our website in the News section here)… however there is really no news, at least the kind of news everyone is looking for, namely the kind of news that indicates this dispute is settled. Since this is a legal matter now, it will likely take some time before its settled. We just hope the PPS can hold out that long. The PPS may dip into the “trips” as they call it (i.e. .000x) if there isn’t some substantial good news shortly. If you visit the website link above, you will see some rather strong posts from Mr. Samblis, which was encouraging, but we need something definitive very shortly to save this PPS from complete disaster. Now, some already think this PPS is a complete disaster, however we would remind you that this is where the PPS was as recently as February of this year. Do we like the PPS way down here, of course not, but we are confident the company will resolve these disputes and it will move forward with its business plan to become a dominate player in its field. What’s the status of PNCH ??? There has been plenty of speculation and assumption surrounding the status of the company since the Joseph Collins (self-proclaimed CEO) of IC Punch Media started his crusade to (what many think is) effort to regain control of his company… that he SOLD to IC Places, Inc in June of 2012. Now… no one that we know has seen the contract of sale, but its highly unlikely there was a buy-back (or take-over) clause in the contract. Selling the PunchTV assets is no different that selling any other assets… say your car for example. Have you ever bought a car, only to have the (previous) owner come back to you in a year of so later and demand it back??? That is ridiculous right? Well, that’s what’s going on here. Collins wants the company back, and he is simply claiming it’s his now. Well… it simply doesn’t happen like that. There this little thing called due-process. So… is there ANY doubt who owns what… and who is legally in control of the company ??? We think not ! PNCH up 10% today ! Yes, that’s right… the recovery continues. Today’s closing PPS of .0044 is getting real close to last Friday’s closing price of .0049. Looks like the stock will FULLY recover from the news on Friday. Well… Mr. Collins actions regarding his disagreement with Mr. Samblis are certainly NOT protecting the integrity of the company. Mr. Collins should have taken actions in a court of law if he thought there were breaches of contracts, NOT publically caused embarrassment and distress on the company and/or shareholders. Maybe Mr. Collins has valid claims, maybe he doesn’t… but clearly his recent actions appear selfish and shortsighted, and clearly are designed to benefit only himself. It’s a fair question to ask… given the recent actions by Mr. Collins… WHO would you want running the company, Mr. Samblis, or Mr. Collins? There likely is not enough information to intelligently answer this question yet, however based on the actions of the two men so far, we think the answer is clear… Mr. Samblis. Its a shame it has come to this, but it wouldn’t be the first time merged companies have these types of difficulties, and it certainly won’t be the last. Please visit our website for more information about the company. Visiting the FAQ page will allow you to follow news and issues over a period of time in chronological order. Use this page for reference when you need links to articles or news events. Also, if you would like to be notified when new posts are made to this blog, please scroll to the bottom and enter your email address. We will never send you spam, never sell or share your address, and your address will be kept in the strictest confidence. Of course you could also simply bookmark this site for easy reference.